For New Year's Eve this year we decided last minute to cook at home. I had an hour to shop and prepare three courses before our guests arrived and it was all a bit of a whirlwind! My local supermarket had sold out of almost everything and I found myself with a basket of food and absolutely no plan as to what to do with it all. By some miracle, the outcome was a pleasant surprise, one which I can see myself recreating throughout this month in particular, when we are all trying to stick to lighter food but simple salads just won't do. 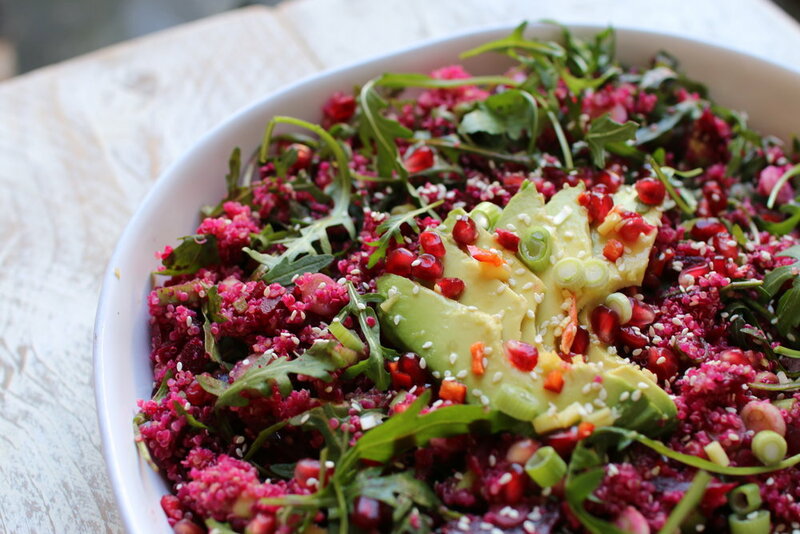 It is packed with plant protein, healthy fats and, just as importantly, flavour! It really feels so nurturing and filling that you know you are getting a whole lot of goodness. I have a big batch sitting in my fridge to take as a packed lunch when I am on the go and it lasts so well. I left the dressing off too so that it feels nice and fresh each time. Peel the beetroot and cut into small chunks to steam. This makes it steam faster. In another pan, cook the quinoa according to the packet. While everything is cooking, finely chop the chilli and ginger and place in a small pot. Add the sesame oil, tamari, honey and the juice of two limes and stir well. Then leave it to one side. Once the beetroot is soft, slice into thin slices then chop in the other direction so you have pieces almost the size of gratings (alternatively use a grater). Once the quinoa is cooked, allow it to cool. In the mean time you can chop the spring onions into fine slices and chop the avocado into small chunks. Once the quinoa has cooled, combine everything in a mixing bowl and mix well. Add the dressing and then serve topped with sesame seeds.